The fourth WallyAce hull has been launched and is named Wally Casa. The 27.33 metre superyacht is currently preparing for sea trials ahead of her delivery later this month. Wally Casa was commissioned by an American owner who will use her to cruise the Mediterranean in the summer and the Caribbean in the winter, on her way to her home in Baja California, Mexico. Built in GRP to RINA class, Wally Casa is nudged to a cruising speed of 12 knots by her two C-12 Caterpillar engines. The naval architecture of this displacement yacht was completed by Wally and AllSeas, which worked on previous WallyAce hulls. Her interior and exterior, by Wally and Luca Bassani Design, creates as much space as possible. Wally Casa’s design focuses on the Wally inside-outside concept that extends the living areas outside and vice versa. This is shown in a range of features including the living area under her superstructure that is surrounded by glass to offer panoramic views. Wally Casa can accommodate seven in her unique three-cabin layout styled in walnut wood with grey fabrics. The configuration includes a large owner’s suite, a double cabin and a twin cabin with Pullman. 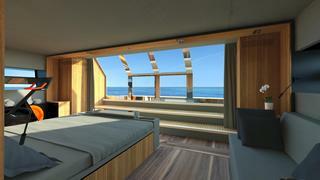 The owner’s suite is particularly special, boasting a terrace on the sea that can be accessed by sliding glass doors aft. Outside Wally Casa boasts plenty of open air spaces over two decks, including the forward cockpit social area of the main deck that has a custom hot tub and sun pads on both sides. 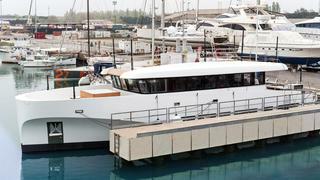 Her aft platform has been extended to enhance the beach resort feeling of Wally Casa.